IP67 waterproof, you can wear it to rain, wash hands, but do not put it in hot water and not fit for swimming. The device will display alert for incoming call, text message and schedule, so information will not be missed. Camera remote control, taking a photo and capturing every memorable moment. Normal battery life for 8 months, power saving mode for 12 months. 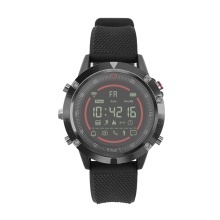 Functions: Step, calories, waterproof, distance, sleep monitoring, call management, health reminder, schedule reminder, sports stopwatch, remote camera, etc. Language: Chinese, English, Russian, Japanese, German, French, Spanish, Polish, Portuguese.